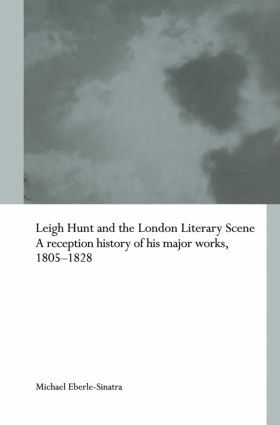 Leigh Hunt and the London Literary Scene reassesses Hunt’s substantial contributions to several different genres and to offer an account of their significant impact on audiences during the Romantic period. It analyzes the intricate relationship between Hunt’s literary efforts and his social and political environment, particularly as expressed in contemporary reviews. This book examines the political and literary importance of Leigh Hunt, a key, yet underrated figure of the Romantic period. It demonstrates that Hunt’s theatrical criticism anticipated the concept of dramatic character that Coleridge and Hazlitt would develop at greater length. It provides a detailed analysis of Hunt’s career as theatrical critic in The News (1805-7) and Critical Essays on the Performers of the London Theatres (1808), presents a new assessment of his poetical innovations in The Feast of the Poets (1814) and The Story of Rimini (1816), and introduces his involvement in the popular travel-literature about Italy in The Liberal (1822) and in Lord Byron and Some of his Contemporaries (1828). This content has been updated on May 10, 2016 at 9 h 20 min.